LinkedIn… home to a social network of over 500 million active professionals. That’s a LOT of users, and more importantly, a lot of potential professionals that you can directly target! But which of the various types of LinkedIn ads offered are best for your business? If you are a B2B company, it’s really a no brainer that you should be advertising on LinkedIn. 80% of B2B leads generated through social media come from LinkedIn. You can get extremely granular with your audience targeting through the various types of LinkedIn ads available, enabling you to reach the people and companies that matter to you. However, before starting a LinkedIn campaign, there are a few questions you should ask yourself. Do I have the budget to advertise on LinkedIn? Like other ad platforms, there isn’t a set cost for a LinkedIn campaign. However, LinkedIn typically has higher CPCs (cost-per-click) than other advertising platforms. Before starting any ad campaign, it’s important to set goals. Are you looking to expand your thought leadership, bring in leads, or build brand awareness? No matter what type of goal you choose, you want to measure the outcomes that will have the biggest impact for your client or your business. In order to do so, it’s important to ensure what key metrics will have the biggest impact. Who are my audiences on LinkedIn? As digital marketers, we are constantly focused on how we can best serve our audiences. Consider who you want to target before setting up your ads. You are able to target your audience by location, company, industry, title, skill level, degree of study and more. For more information on targeting, check out LinkedIn’s Targeting Capabilities guide. What are the types of LinkedIn ads that I can use for my business? Lead Gen Forms (can be used with Sponsored Content & Sponsored InMail). Now that you’ve got an idea on what to ask yourself before setting up a LinkedIn campaign, it’s important to pick the ad format that best fits your goals. What are each of the types of LinkedIn ads and why should I use them? Through Sponsored/Direct Sponsored Content, you are able to promote your company updates, share pieces of content, drive users to a landing page, and more to targeted audiences on desktop, mobile, and tablet. You can either use a cost per click model or a cost per thousand impressions model. 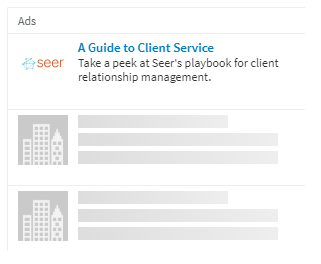 Sponsored content promotes a piece of content that you already have on your LinkedIn company page. You can use Direct Sponsored Content to personalize and test content in the news feed without creating posts on your LinkedIn company page. When Should I Use Sponsored/Direct Sponsored Content? These types of ads naturally lead to more engagement because they are placed directly in a user’s news feed. You are able to use more text and larger images in order to entice users to click through to your landing page or to bring in more brand awareness. If you have a piece of content or are looking to drive people to a blog post, utilizing Sponsored/Direct Sponsored Content is an effective way to do so. 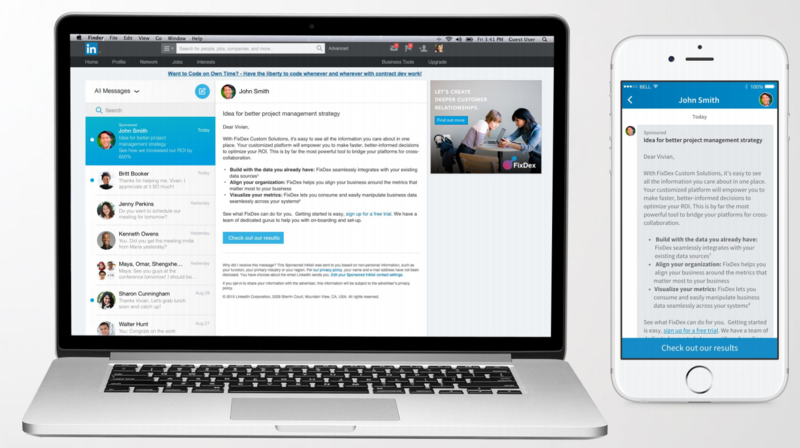 Users view Sponsored InMail messages across all devices. This allows you to drive more leads and engage your target audience by delivering personalized, private messages right to their LinkedIn inboxes. Sponsored InMail messages consist of a custom greeting, call-to-action button, body text, and ability to add a link to the message body. These messages are purchased on a “cost per send” basis. That means you will pay per unit for each message delivered. This ad format appears in the message center the same way as regular InMail. When Should I Use Sponsored InMail? 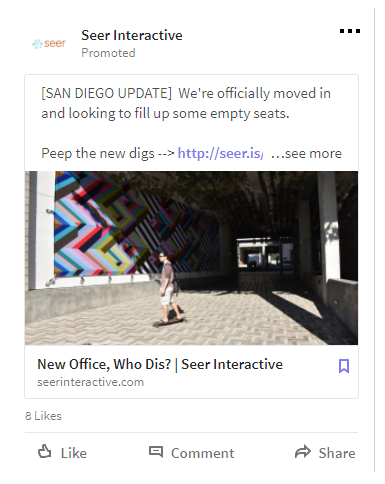 This ad format is highly personalized due to the fact that you are sending a direct message to a LinkedIn user who is in your target audience. This can help your lead generation immensely. There is also 100% deliverability. LinkedIn sends out a sponsored InMail to a user only when that user is online. Therefore, it will be placed right at the top of their inbox. These types of ads are very similar to Google/Bing search ads. You are able to create multiple ad variations per campaign, which makes it easy to test out the best performing images and copy. It’s important to note that these ads only run on desktop and are shown on the right rail of the news feed. You can either use a cost per click model or a cost per thousand impressions model. When Should I Use Text Ads? If you are looking to run a quick campaign that is easy to setup and manage, Text Ads are the right ad format for you. These ads are also great for Brand Awareness. That’s because text ads typically have a lower CPM compared to other LinkedIn ad formats. 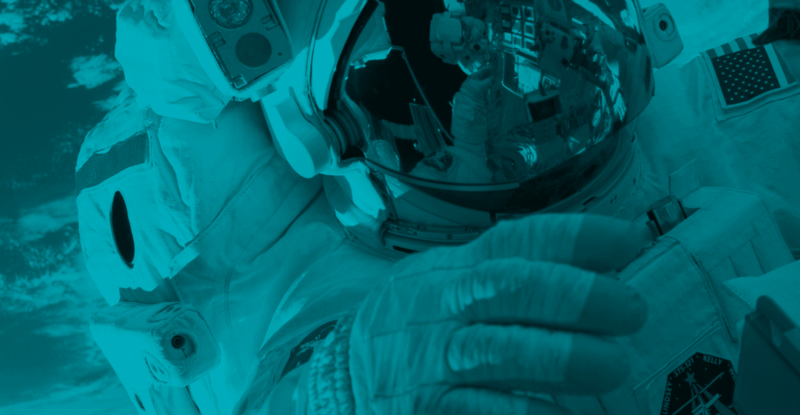 Engage users with dynamically generated, personalized ads. Drive users to like your company page or apply for a job. You can also instantly generate leads and enable content downloads, such as the download of an ebook or whitepaper, directly from the ad itself. You will find Dynamic ads appearing on the right rail on Desktop only. When Should I Use Dynamic Ads? Dynamic ads are highly engaging and very effective at driving traffic to a landing page/company page. This is due to the dynamically generated ad format that leverages information from LinkedIn member profiles. These types of ads are great for advertising job openings or getting users to follow your LinkedIn company page. Members can also send you their full name and email address directly in the dynamic ad, without ever having to type their info by hand. Once someone submits their information through the ad unit, your content will automatically start downloading to their desktop. A big advantage with using Dynamic ads is that LinkedIn only serves two visual ads on a page at one given time. 58% of marketers say increasing lead generation is the most important goal in marketing. Collect even more quality leads from your ads on LinkedIn with pre-filled forms with user’s LinkedIn profile information. Lead Gen forms look very similar to Sponsored Content when viewing them on the news feed. Lead gen forms are available in Sponsored Content & Sponsored InMail. These are also only currently available on mobile. Why Should I Use Lead Gen Forms? The advantage of utilizing Lead Gen Forms is that a user does not have to leave LinkedIn in order to fill out a form. Choose the fields used in the form and create up to three custom fields. Stay tuned for other blog posts on a basics of LinkedIn Advertising and a step-by-step guide on setting up LinkedIn Ads!